The Pars come away from Dundee with a very creditable point after an entertaining scoreless draw at Dens Park. Both goalkeepers had some very good saves otherwise the score could have ended up 4-4! Jim McIntyre, in his first official game as manager of Dunfermline Athletic FC, stuck with the same starting line up as faced Livingston midweek. Paul Gallacher was in goals with Woods, Harris, Thomson and Murphy the back four. Stevie Crawford retained his position in midfield alongside Simmons with McGlinchey and Scott Morrison on either side. 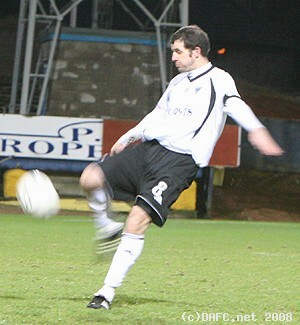 Jim Hamilton and Mark Burchill were there to score the goals. With the large travelling support behind them the Pars were playing up the slope and into the strong breeze. 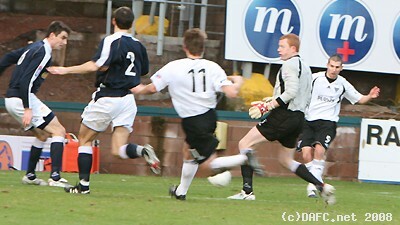 It was actually Dundee`s Derek Lyle who was first to test the goalkeepers with a shot wide after only 3 minutes. Burchill then tests Samson in the Dundee goal in 5 minutes with a shot saved. Michael McGlinchey worked his way in from the right touchline only to be chopped down. Scott Morrison takes the free kick from 25 yards out and his shot was saved by Samson. 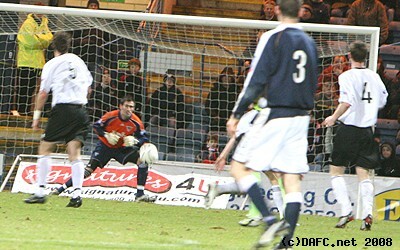 Robertson has a good shot in 11 minutes well saved by Gallacher with Harris neatly tidying up giving Dundee a corner. Mark Burchill is through in 19 minutes with only the keeper to beat as he goes past the keeper but is too wide to cut the ball back on target. That seemed a bad miss as Dundee almost score right away at the other end and only a last gasp sliding tackle on Lyle by the brilliant young Calum Woods saved the Pars from going behind. From the resulting corner Danny Murphy made a clearance off the goal line proving the value of a man on the post. The Pars similarly had a shot cleared off the Dundee line by a defender a few seconds later as this game went from end to end. Some slack defending allowed McDonald to hit a shot from 18 yards that Gallacher did well to turn round his left hand post. A good shot by Scott Morrison in 27 minutes just fizzed over the Dundee bar. Once again there was some great running and closing down by Burchill who followed on from the last game at Livingston closing the keeper down at every opportunity. He did it again in 28 minutes and manages to win the ball from the keeper as the clearance ricochets off him. He manages to square the ball to Hamilton but his shot is straight at the keeper Samson who had scrambled back into his area. 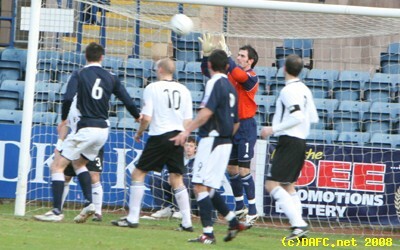 It was Burchill`s turn in 33 minutes as he got in a good shot again saved. Jamie Harris made a good clearance in 37 minutes for a corner although Dundee came very close as a glancing header scrapes the far post as the ball went across the goal mouth. Half time 0-0. The Pars atarted the second half with probably the best chance of the half. Again, good closing down work by Burchill against the left back and manages to get the ball through to an inrushing Hamilton as the ball fell to him and only with Samson to beat he manges to slide the ball wide past the keepers right hand post. No wonder he held his head in hands! Jim had been having another good game despite that miss. Clearly frustrated by his miss a few minutes later Hamilton was booked for some back chat to the referee who was becoming increasingly incompetent aided by two linesmen who were just as bad. Crawford was then booked in 53 minutes and that also appeared to be for backchat. McDonald had a good shot stopped by an equally good save in 54 minutes. Former Par Freddie Dacquin ballooned a ball over in 55 minutes. Back up the other end Gallacher again made a good stop this time from Lyle. Calum Woods made a great lung bursting run down the right wing and as he cut the ball inside there was noone to step in and have a shot as the forwards tippy tapped the ball across the 18 yard line, burst the f*****g net someone, PLEASE! Samson makes another good save in 61 minutes from Hamilton at his near post. Stevie Crawford is still looking a bit lost in midfield and is not strong enough but he did get a shot in just wide in 62 minutes. Danny Murphy had been playing well and a good cross in 65 minutes resulted in a corner for the Pars. Scott Thomson was replaced by Scott Wilson in 66 minutes which could only be for an injury as Nipper had again played well and is looking much more like his old self.